Vascular skin lesions such as telangiectasia in the face are generally common cosmetic blemishes. Women consider such vascular ectasia to be annoying, as it is difficult to conceal them with makeup. Among men, there is also increasing readiness to have these removed and to pay privately for the treatment. For the treatment of fine, superficial vessels, which are common in the face, the QuadroStarPROYELLOW and the QuadroStarPROGREEN (577 & 532nm) are highly suitable. In fact, these special wavelengths are readily absorbed by the hemoglobin of the blood vessels. That means that the light is converted to heat, the blood vessel is damaged and disappears. The water surrounding of the vessel (tissue contains a high percentage of water) doesn’t absorb the green or yellow light at all, which results in the surrounding skin being spared. The vessels are ‘erased’ immediately without unattractive purpura (purplish discoloration). The risk of pigment changes and scarring is also very low. Leg veins remain one of the cosmetic problems where treatment is sought very frequently. For larger ectatic vessels, which are normally deeper in the skin, for example leg veins, the penetration depth of the green and yellow light is often not sufficient. Therefore, a longer wavelength of light in the near infrared range with sufficiently high power is necessary. The high-power diode lasers of the MeDioStar NeXT Family feature a special handpiece with a smaller spot, designed specially for the treatment of blood vessels. 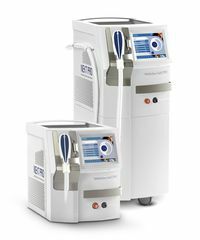 Due to the higher penetration depth of laser light, lasers with wavelengths in the infrared range, such as the MeDioStar diode laser, are very well suited for the coagulation of leg veins and small vessels on the face. The blood readily absorbs the light while the water in the surrounding skin does not, ensuring effective damage to the blood vessel while protecting the surrounding skin at the same time. When treating vascular lesions, the light beam goes into the skin and is absorbed by the hemoglobin of the blood. This means that the blood is warmed significantly. This leads to an inflammation of the inner wall of the vessel and thus generates a bonding of the vessels. The result is the occlusion of the vessel, which takes some time depending on the size of the vessel (it takes more time for larger vessels, up to a few months for the deep bluish ones). Each laser beam has a certain color (wavelength). For small ectatic vessels, which are normally red and superficial, the yellow and green laser beams are particularly suitable, because they are readily absorbed by the blood. On the other hand, the water absorption is very low. Since normal skin consists mainly of water, the bloodless skin remains almost cold and so there is a very minimal risk of damaging the skin surrounding the vessel. For larger and deeper vessels (bluish), the infrared laser beam is more effective because this light penetrates deeper.